With a stay at Holiday Inn Napoli in Naples, you'll be in the business district, steps from Centro Direzionale and a 4-minute drive from Naples National Archaeological Museum. This 4-star hotel is 4 mi (6.4 km) from Piazza del Plebiscito and 4.2 mi (6.8 km) from Port of Naples. Make yourself at home in one of the 324 air-conditioned rooms featuring refrigerators and LCD televisions. Complimentary wired and wireless Internet access keeps you connected, and satellite programming provides entertainment. Private bathrooms with showers feature complimentary toiletries and bidets. Conveniences include phones, as well as safes and desks. Enjoy recreation amenities such as a 24-hour fitness center or take in the view from a terrace. Additional features at this hotel include complimentary wireless Internet access, concierge services, and babysitting/childcare (surcharge). Getting to nearby attractions is a breeze with the complimentary area shuttle. 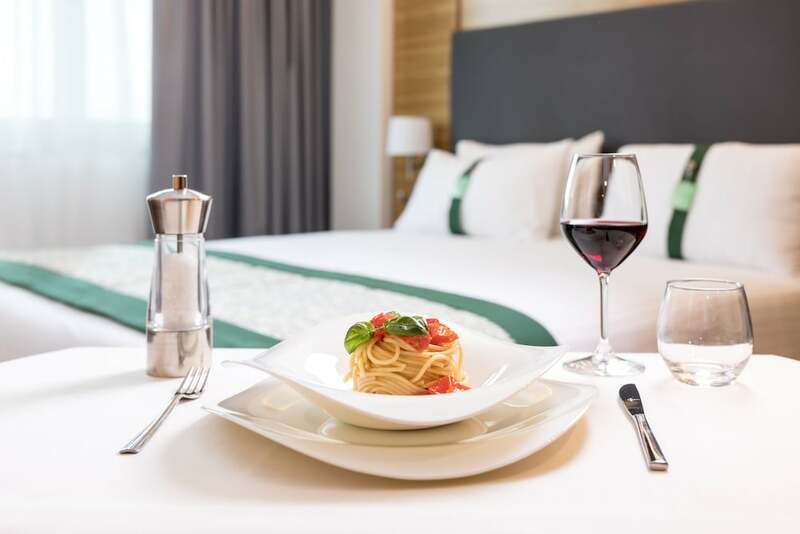 Satisfy your appetite for lunch, dinner, or brunch at Bistrot Victor, a restaurant which specializes in Italian cuisine, or stay in and take advantage of the room service (during limited hours). Wrap up your day with a drink at the bar/lounge. Buffet breakfasts are available daily from 7 AM to 10 AM for a fee. Featured amenities include complimentary wired Internet access, a 24-hour business center, and complimentary newspapers in the lobby. Planning an event in Naples? This hotel has facilities measuring 923 square feet (86 square meters), including a conference center. A train station pick-up service is provided at no charge, and self parking (subject to charges) is available onsite. A tax is imposed by the city: EUR 3.50 per person, per night, up to 14 nights. This tax does not apply to children under 18 years of age.